The lower half of the Pac-12 adds some of the country’s most fascinating freshmen as well as some critical returns from injury, so we’re really excited to see how lineups pan out for these four teams in 2019. All four had flashy additions in 2018, but all but one had a disappointing end to the season. This year there might be less fireworks, but each teams has the potential for steady and reliable growth. The Sun Devils have every reason to hope for growth in 2019: After their sole senior Nichelle Christopherson hurt her ankle midseason in 2018, they were forced to adjust their lineups and thus have already learned to live without her. Their freshman class in 2019 isn’t revolutionary, but after a breakthrough year in 2018, it’s not a bad thing for Arizona State to settle into a pattern of slow and steady growth. Vault has come a long way since the Sun Devils were regularly counting several Yurchenko layouts only a few years ago. This year, they return a cluster of Yurchenko fulls that range from acceptable to great and will have the depth to drop some of the lowest scores. Freshman Stephanie Tripodi had reliably great scores in J.O. and will be the leading freshman contender, but Jasmine Gutierrez’ Yurchenko full looks solid on video. The Sun Devils also have some returning backup vaulters, and Katelyn Lentz will hopefully find her way back into this lineup after an ankle injury ended her 2018 season. This is the weakest event for Arizona State’s freshman class. The only new contributor here is likely to be Harvey, who has some odd leg separations throughout her routine but whose ridiculous toe point makes her stand out regardless. Tripodi has great technique in training clips, but lack of recent full routine videos makes it difficult to tell why her routine scores are often lower. Lentz will be a useful re-addition this year, Justine Callis has some intermittent strong scores and Graycee Rushton was a star in J.O. and a useful mid-lineup routine in 2017 before sitting 2018 out on this event. Harvey can be inconsistent here, but her form is great and her J.O. choreography was incredibly unique. Tripodi is very precise and has a solid J.O. scoring record, and Gutierrez’ consistency is a serious weapon; she also competes a Rulfova on beam, the second for the Sun Devils! These three can complement a lineup that was already a strength in 2018 and has the potential to clean up even more as key competitors like Justine Callis and Anne Kuhm try to make the most of their senior seasons. Harvey might need a touch more difficulty to make lineup here, but she has a spectacular presence on the floor that the crowd in Tempe will love. Tripodi is a gorgeous twister, opening her routine with a front double full executed with one arm over her head in the style of a diving twist. Gutierrez looks like a backup option but could definitely surprise. The Sun Devils could also benefit from bringing Lentz and perhaps Corinne Belkoff into the picture more regularly here. Plus, Maya Williams has popped up in training after not competing last season. For teams who improve as rapidly as Arizona State did in 2018, there’s always a concern of a painful fall back to Earth when mid-lineup athletes who had to peak week after week to keep results up finally stumble. We can’t predict the future, but it certainly doesn’t seem like the Sun Devils are due for that sort of tumble. 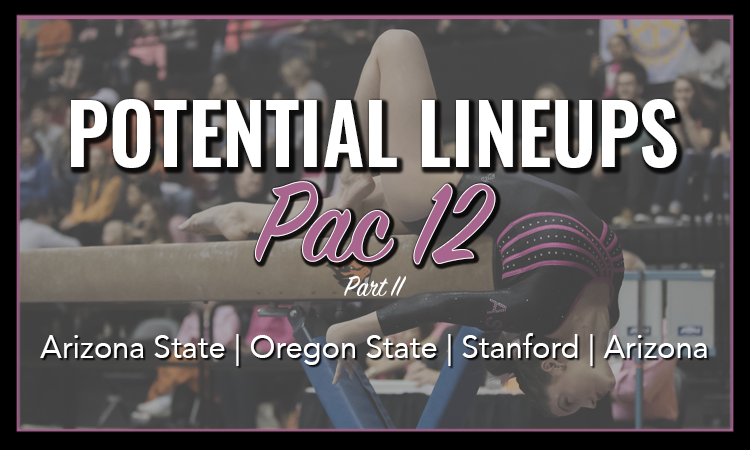 They return nearly a full team lineup of very solid routines and freshman options to replace the least reliable ones. Expect twin all around sets from Cairo Leonard-Baker and Kuhm to continue driving the Sun Devils’ lineups in 2019. Oregon State doesn’t have quite the depth we expected a few months ago after the news of Jade Carey’s deferral was swiftly followed by several injuries. That shouldn’t be a problem for the Beavers, whose large roster includes some sneaky new routines from returners as well as a strong slate of freshmen. But it might take a few weeks to sort through all of the lineup options. Keep in mind that Alyssa Minyard and Lena Greene are most likely out for the season while Destinee Davis and Sabrina Gill have injuries that impact training for now but are expected to return. Recent training footage has shown a parade of around 10 respectable Yurchenko fulls from the Beavers in addition to Mary Jacobsen’s handspring front pike half, a potential change from her usual full-twisting Tsuk. In addition to the standard returners, contenders include previous lineup outsiders like Savanna Force, Lexie Gonzales and Niya Mack. Perpetually injured Lacy Dagen is finally in shape and looks exciting here, as does her freshman sister Madison. Isis Lowery is training this event as part of her fairly credible push for the all around, and while all three non-Dagen freshmen have respectable but not outstanding vault scores from J.O., Kristina Peterson is the one from whom we’ve seen the most in training. Bars doesn’t have as much depth as some of the Beavers’ other events, but they have plenty to work with. Lowery’s work has been a constant feature of training updates. Jacobsen has upgraded her dismount to a stickable double front half. Sophomore Colette Yamaoka can be beautiful here and has a good shot after performing in exhibition last year. Corvallis native Jaime Law could also figure in. Of the freshmen, Madison Dagen could be an immediate star and Leah Bivrell also has strong J.O. scores. Interestingly Kaitlyn Yanish has been spotted training this event recently, and while her technique is great, she’s still one skill away from being up to the level for NCAA—unless Oregon State has a secret. It wouldn’t be the first time. Both Dagen sisters are potential superstars on beam, and if they’re consistent, they could lift this already beautiful lineup to another level. Freshman Peterson is one to watch on this event, with a fascinating shoulder stand mount and great technique. Alexa McClung and Force are both training beam, but it’s uncertain how seriously they can contend. Lowery and Mariana Colussi-Pelaez will both be targeting permanent spots and will be useful backups even if they don’t crack the top six. Floor could be complex for Oregon State, with at least eight strong returners fighting for spots as well as a handful of newcomers. Lacy Dagen has looked strong despite not even being rostered to compete it (though it’s not unheard of for the events listed on team rosters not to reflect reality) while younger sister Madison could make waves with her gorgeous front layout + front double full first pass. Jacobsen is once again working upgrades—this time a new double front—and Colussi-Pelaez has been tumbling. Yamaoka and Lazaro are both athletes who are growing steadily, and Lazaro in particular looks like a contender. Freshmen Peterson and McClung have strong J.O. scores and are solid tumblers. Oregon State’s lineups look a little chaotic at this point, but its level of depth is a good problem to have. It’s even difficult to imagine who will be competing the all around, with Gill and Singley returning and Lowery, Madison Dagen and Yanish seemingly targeting it. Expect the new routines to trickle in over the season rather than transforming the team completely in week one—with the possible exception of freshman Madison Dagen, who could be incredibly impactful in 2019. 2018 was a bit of a letdown for Stanford after many routines from its standout freshman class developed technical flaws that held its scores down and injuries led to a depth crisis on several events. This year should be considerably less painful, with five freshmen and two high profile returns from injury adding major routine volume, but the Cardinal will still need to find more potential 9.900 routines. The Cardinal trialed several vault contributors in 2018, and we should expect more of the same this season with numerous acceptable new options. Freshmen Morgan Hoang, Grace Waguespack and Madison Brunette all bring solid Yurchenko fulls. Grace Garcia has just started vaulting again after an ankle injury ruled her out in 2018, and her Tsuk full will likely appear at the end of the lineup. Other options include Catherine Rogers and Aleeza Yu, both of whom had strong Yurchenko fulls prior to injuries that affected their 2018 seasons. 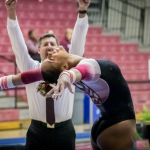 Bars was Stanford’s biggest challenge in 2018, with a serious routine shortage doubled with numerous technical issues seeming to appear out of nowhere in routines that looked great in preseason. Luckily, bars gains numerous routines this year. Eve Micco is perhaps the leading contender with a very precise bail and a double front dismount while Brunette’s Deltchev is flashy and technically strong. Waguespack’s routine has a solid body, but her habitually piked-down double layout dismount might cause problems. Wesley Stephenson is a strong backup option. Don’t discount Rogers after her fraught few weeks in this lineup in 2018—she seemed to return before she was ready due to the depth crunch, but she can be strong on this apparatus. Garcia has looked strong here in training, and Yu had good results on bars prior to her injury. Beam is the event on which the Cardinal gains the least immediately useful routines, but it returns enough options that it should be comfortable regardless. Of the newcomers, Stephenson seems like the strongest choice, with a J.O. career high of 9.775 and the style you would expect from a Legacy Elite alumna. Waguespack has the occasional flicker of leg form but distracts from it with great presence. 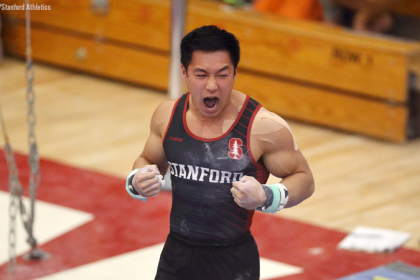 Hoang has been training this event despite being rostered as a vault/floor specialist. If things get tight here, Nicole Hoffman and Taryn Fitzgerald have both competed beam in the past and popped up preseason training clips. Yu has also looked strong in training, and Rogers got good scores in J.O., so she could be a useful backup. Floor was the event on which Stanford’s 2018 freshman class adjusted best to college, so it’s likely to be the team’s strongest this year. Expect many of these returners to hang onto their lineup spots with just one or two freshmen replacing weaker routines. Waguespack and Micco both bring high-quality twisting form but will need to prove they can land their first passes—a triple and a two and a half twist, respectively—to crack the lineup. Possibly more reliable is Morgan Hoang whose double layout will become one of the prettiest in the NCAA if she maintains her J.O. form. It’s likely that Taylor Lawson will make another stab at this lineup and that usual backups like Nicole Hoffman will stay on the fringes. 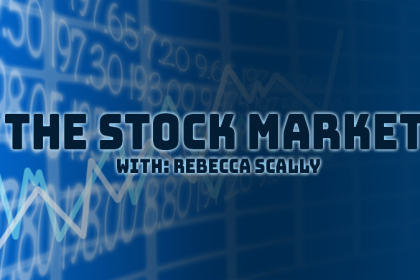 Stanford has an opportunity for growth in 2019 without the depth crunch that caused so much difficulty last year. That said, without perpetual life raft Elizabeth Price on the roster, as goes the Cardinal’s sophomore class so goes the team. If the likes of Flam and Navarro keep scoring so many 9.700s, things could get really challenging in 2019. 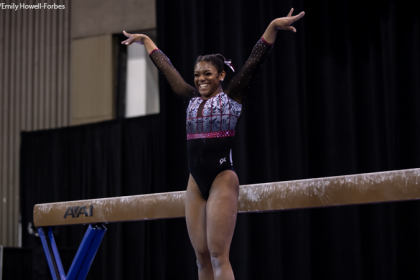 Those two will likely see at least some time in the all around, but Kyla Bryant has all the necessary pieces to lead the team this year and become a competitive all arounder on the Pac-12 and national levels. Arizona had a year to forget in 2018, finishing outside the top 36 for the first time since at least 1998 after a number of untimely injuries. With a class of five freshmen and the return of Payton Bellows, the Wildcats will fight to return to regionals in 2019. Vault was a weaker event for the Wildcats in 2018, with Bellows going down with an Achilles tear midseason not helping. None of the freshmen stand out on the event, but the best of the bunch is Kennedi Davis who sports a clean and comfortable Yurchenko full. Asia Rose DuVernay has a usable full, and MacKinzie Kane’s same vault isn’t amazing but could be necessary depending on how things shake out. The star of the event will hopefully be Bellows, who competed a Yurchenko one and a half pre-injury. Overall, the Wildcats should have some depth on the event, but the question is who can perform consistently well—none of the returners have an RQS over 9.800, and some of the inconsistent competitors didn’t fare much better average-wise. Bars was a strength for Arizona in 2018 and its highest ranking event at No. 28. The Wildcats return four of seven consistent competitors on the event in addition to having a relatively strong freshman class on bars. Kane presents a good option on the event with her lines and double front dismount. DuVernay and Alivia Kendrick both dismount with double layouts, but DuVernay is the stronger of the two while Kendrick will need to touch up her handstands. Bellows did not compete bars last year but has been training it recently as she works back from her Achilles injury. The Wildcats aren’t short of beam options, having trialed 10 different gymnasts on the event at various points in 2018. Seven of those 10 return, and the freshmen are also strong here. Davis will lead the way with a strong and secure routine that features a triple series. Kane is an option as well. Kendrick’s J.O. routine is not up to the level, but if she can add the necessary skills, she could be a good option as well. Floor was a struggle for the Wildcats in 2018, especially after losing Bellows. This season’s floor squad returns just three consistent competitors, but it gains Bellows back and virtually every freshmen has the potential to contribute. Davis is a strong option, opening with a double full. DuVernay is also an option, boasting clean tumbling with secure landings. Kane has the potential to contribute; she’s a strong twister and carries her lines into great extension in her leaps. Kendrick has been hit or miss on the event and hasn’t competed it a ton in her recent J.O. seasons, but she has potential as well. Replacing a senior class that included superstars Kennady Schneider and Madison Cindric is no easy task. The Wildcats hope the incoming class, as well as the returners, can do just that. The freshman class is strong, having more talent than it appears at first glance. Will it be enough for Arizona to break back into the top 36 or even further? Expect Leydin to return to the all around, and keep an eye on Bellows and Leung who are also possibilities on all four events.